Most of the half-million or more vehicles damaged after Harvey and Irma will be headed to the scrapheap — but thousands more could wind up on the used car market, often in states far away, where buyers may not suspect they’d been damaged until it’s too late. Vehicles that have been submerged, especially in salt water, can experience serious problems, though not always immediately. But there are ways to protect yourself if you’ll be in the market for a previously owned vehicle. Jonathan Smoke, chief economist for Cox Automotive, has estimated up to 500,000 were damaged by Hurricane Harvey, most by flood waters. That would be nearly twice as many as were destroyed following Superstorm Sandy, and about 2.5 times more than the number of vehicles wrecked by Hurricane Katrina, according to Louisiana State Police. Could You Be Sold a Flood-Damaged Car? "A car that's been in a flood, with the engine emerged for any length of time, will never be the same," said Carl Sullivan, a veteran inspector for California-based AiM. All too often, such vehicles get, at best, cosmetic repairs that mask, rather than resolve, longer-term issues, such as rust, mold, and mechanical problems that could plague buyers later on, experts warn. Today’s high-tech vehicles are particularly vulnerable to damage that can eventually short out electrical and electronic circuits, everything from airbags to infotainment systems, and such problems may not show up initially. It’s actually not illegal to sell a flood-damaged vehicle. You can find auctions that specialize in them with a quick online search, and some buyers who know how to cope with the likely damage will go after them as potential bargains. But while those vehicles are supposed to be clearly identified, that’s not always the case with less scrupulous resellers. And if you’re not careful, you could wind up finding yourself underwater considering the costly repairs such vehicles may need. 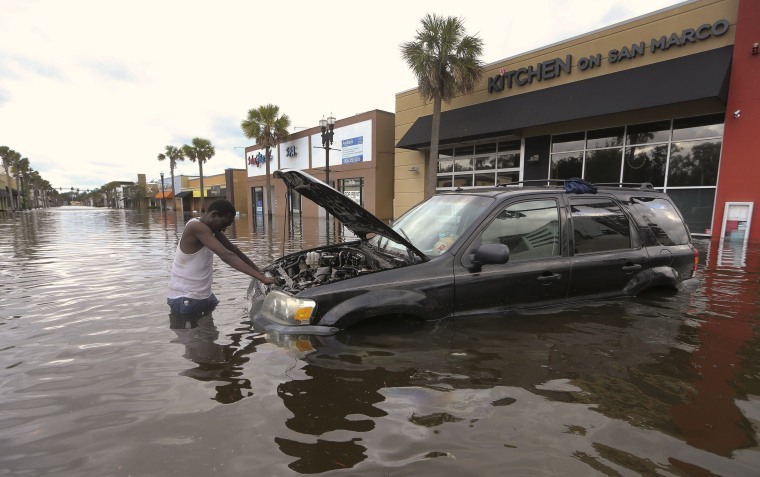 The problem is that some con artists pick up flood-damaged vehicles on the cheap and then move them from state to state, taking advantage of the fact that some warnings added to a vehicle’s records might not carry over, a process known, appropriately enough, as “title washing,” explains the National Insurance Crime Bureau. In some cases, private owners, especially those unable to make insurance claims, may try to personally resell their vehicles and simply not report the damage, even though that is required by law in most states. But there are some things you can do to minimize your risk. Start by checking title services such as CarFax. The modest fee could be more than offset if you were to discover you were about to buy a damaged car, truck or crossover. You can also play detective on your own, looking for signs a vehicle spent time submerged. Look for rust in areas where water might have pooled. Electrical circuits, such as head and taillights are more prone to shorting out — as are the numerous electronic control systems common in today’s vehicles. And mold can develop in hidden places. A musty or moldy smell. When shopping for a used car, the experts say, trust your nose as much as your eyes. Buyers should also make sure the Vehicle Identification Number on the dash matches the one on the vehicle's driver door jamb. Again, the cost of an inspection can be more than offset if a mechanic spots trouble — and that could include crash damage and other troublesome issues, as well as flood damage.